Karen Carpenter's iconic vocals w/ new orchestral arrangements! 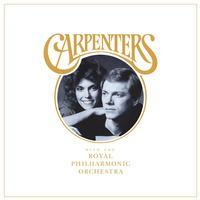 Richard Carpenter has made a new album of Carpenters classics at London's prestigious Abbey Road Studios. He has teamed up with The Royal Philharmonic Orchestra for a new album, to be released via Universal. The 2LP set will feature his late sister Karen Carpenter's iconic vocals placed on top of brand new orchestral arrangements.